Meatballs and gravy are two of my all-time favorite foods, so this Bubble Up Swedish Meatball Casserole is totally my kind of comfort food. I mean, saucy, meaty, cheesy and full of tasty, hearty biscuits – who wouldn’t want to dive right into this recipe? Plus it’s super easy so it’s perfect for a weeknight dinner. Add a salad or some roasted or steamed veggies on the side and you have a perfect meal. 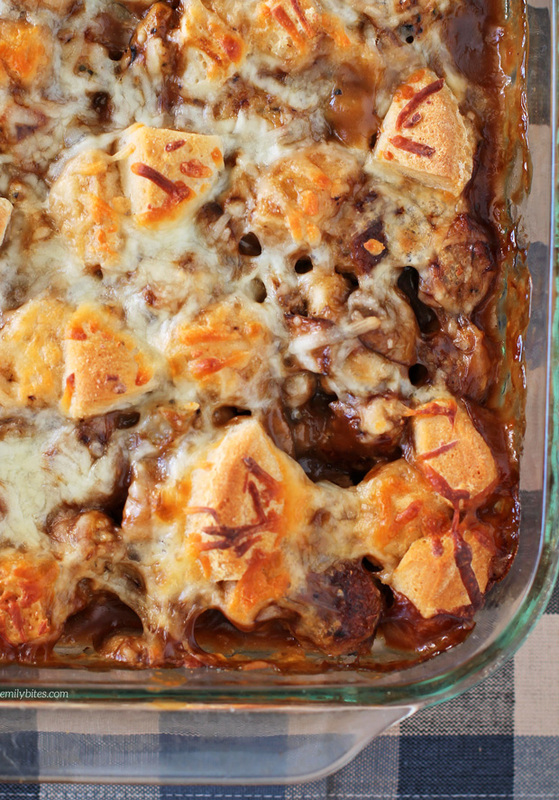 Plus, a serving of this casserole is just 338 calories or 7 Weight Watchers SmartPoints! Disclaimer: This is not by any means a traditional Swedish meatballs recipe. I wanted to make a casserole with meatballs and gravy (two of my favorite foods) and when I tried this I thought it tasted like Swedish meatballs, so that’s what I named it. I got a few comments about these not being Swedish meatballs, so maybe I should have named it something else (sorry! ), but since it’s already out there I figured I’d just address it here. Whether you want to call it a Bubble Up Swedish Meatball Casserole or a Meatballs and Gravy Casserole or anything else, the fact that it’s easy and delicious remains :). On a Weight Watchers note…I have an update! I have been working hard to update all my recipe posts to include the new Weight Watchers SmartPoints values and I’m making some headway. I have completed all of my 2015 recipes and I’m almost all the way through 2014 – it’s coming along! I still have to do 2013-2010 but the plan is to have everything done before the new year. Wish me luck! 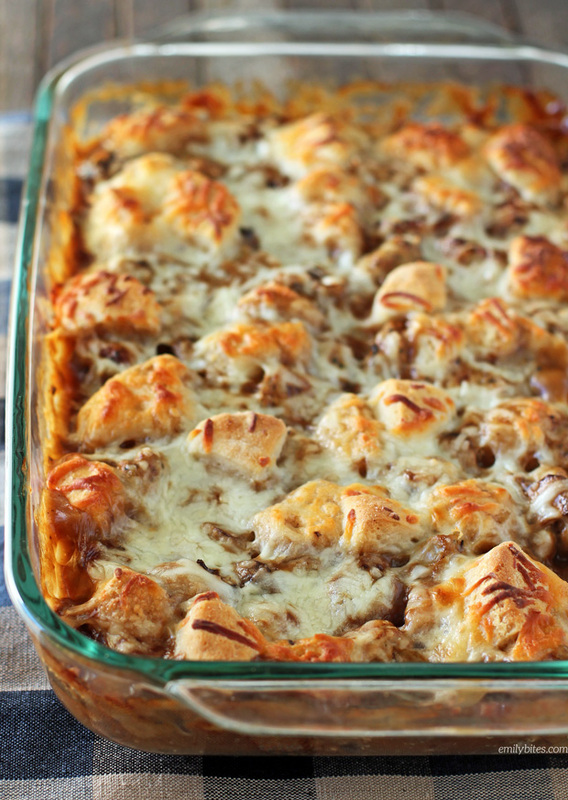 You know you love bubble up casseroles…make sure to check out my Pizza, Enchilada, Breakfast and Chicken Pot Pie versions! In a large mixing bowl, combine the ground turkey breast with the Parmesan cheese, bread crumbs, parsley, garlic powder, egg, egg white and milk and stir together (or mush with your hands) until mixed. Roll the mixture into about 60 meatballs (roughly 1” diameter). Heat a tablespoon (or 1 ½ teaspoons if you’re cooking the meatballs in 2 batches) of the oil in a large skillet over medium heat. Place the rolled meatballs into the skillet and cook, stirring occasionally, until the meatballs are browned on all sides and cooked through. Remove the meatballs to your prepared casserole dish. Place the remaining teaspoon of oil in the same skillet and bring to medium heat. Add the diced onion and the sliced mushrooms and cook, stirring occasionally, for about 5 minutes until the onions are softened and translucent and the mushrooms are softened. Add these vegetables to the meatballs in the casserole dish. Mix the cream of mushroom soup and the beef gravy together in a mixing bowl and pour over the top of the ingredients in the casserole dish. Use a spoon to mix everything together. Add the pieces of biscuit dough and stir to coat. Bake for 25 minutes. Remove from oven and sprinkle the shredded Mozzarella over the top of the casserole. Bake for an additional 15 minutes until hot and bubbly. I need to make this ASAP as my boyfriend is obsessed with both bubble up casseroles and meatballs! 🙂 any ideas for mushroom substitutions? I seriously dislike them. I hope you both like this one! Hm, I’m not really coming up with anything as a substitute for the mushrooms. Maybe just leave them out? Thank you for including the weight of the cheese! I always worry I use too much. Looking forward to trying this, I *love* Swedish Meatballs! And thanks also for working so hard to get your site updated with Smart Points. You’re awesome! Thanks Jennifer!! I hope you love this! There is nothing Swedish about these meatballs. I know since I lived in Sweden. Looks good! I might try it with red sauce since my family is super picky – I wonder if it would work. Either way, looks great! And I really appreciate you going through and updating your recipes!! SO helpful! I use the plan to eat website to store my recipes, and while I could definitely figure out the points myself – I appreciate that I don’t have to! I think this sounds good, and a little nutmeg and allspice in the meatballs would make it more “Swedish”. Can’t wait to try it. Thanks Emily! Yes, that would definitely make it more Swedish :). I named it after my initial reaction to what it tasted like without really thinking about it, but these definitely aren’t traditional Swedish meatballs. I hope you like it! I was so excited when I read the recipe and then I started adding up the amount of sodium in it. 6,970 mg of sodium for the whole thing, 1,161 mg per serving. The biggest culprits are the soup and the gravy. I can make my own Condensed Cream of Mushroom soup. Can I use my own gravy? Thanks Emily. I bought the ingredients at the store today, and I’m sure my family will love it! HOLY COW!!!! Mine is cooling right now, and if it tastes even a fraction as good as it looks, I know I’ll be in heaven!!! I do have a question… in the ingredients, you call for parsley flakes, but in the directions you call for itallian seasoning?? I used itallian seasoning and not the parsley flakes…. is that correct?? Thank you so much for sharing your yummy recipes! Looks really yummy! Thanks for sharing the receipe. I will try it for sure during the holidays. More on the “Swedish” note…. What is the definition of SWEDISH meatballs? I am Swedish, born and raised in Sweden and currently still living in Sweden and for me there is no such thing as a receipe of SWEDISH meatballs. 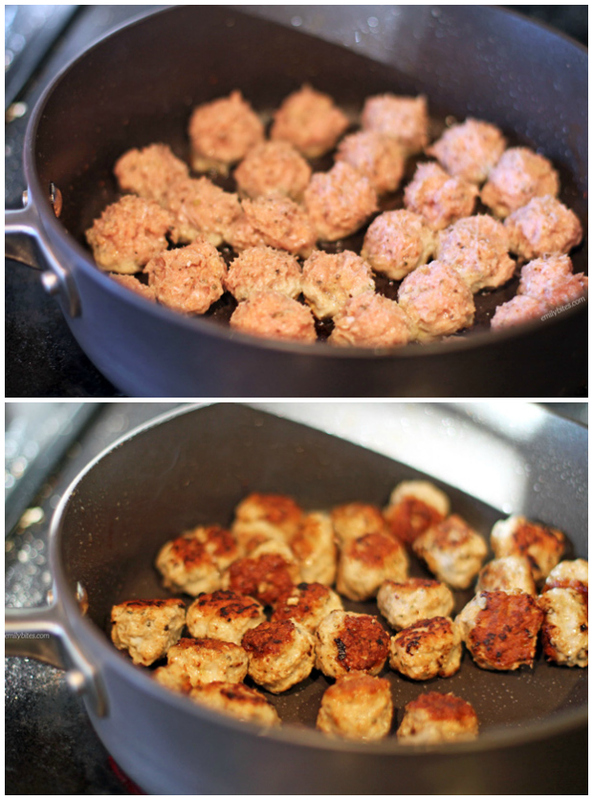 Every Swedish cook has their own “secret” receipe for meatballs. There are no rules or regulations that makes some meatballs more Swedish than others. I think the name is appropriate for the dish. Keep it! Happy Holiday wishes from a cold Stockholm! This looks fantastic….. what is the serving size on this? How many meatballs per serving? It says to make 60 meatballs.. so it’s 10 meatballs per serving? That seems like a lot. What is serving size of this? Hi Wendy, the serving information is always listed directly underneath the recipe title in the recipe section of the post. This recipe makes 6 servings, so just cut the casserole into 6 pieces and serve! Yet another recipe that I got my boyfriend to love!! So delcious. I did use chicken and it came out great. I added a little nutmeg to the meatballs for a little extra something! Great recipe! I made this for my family last night and it was a hit! I just wish I had more leftover! I made this tonight and it was very time consuming- I have so much trouble with meatballs! They took me forever to make and I had trouble keeping them in shape cooking them. Do you have any tips? The recipe all together was delicious and such a large portion for the points! Hi we don’t get an kind of ready made biscuits or buns in New Zealand what would u recommend instead? This looks so delicious and everything I’ve made so far has been great. I was just wondering if there was an easy way to print out the recipe. Thanks for all the amazing recipes. I am loving your recipes but I am noticing that the smart points are hardy ever what you say they are. Like this one is 8 not 9 which is better but the following are rally off. I’m not sure how you’re calculating those points, but here are some answers from my FAQs that may help! I use the Weight Watchers Recipe Builder to calculate the SmartPoints values for every one of my recipes unless otherwise noted. Any discrepancies are most likely due to us using different brands or ingredients. The nutrition information of similar products from different brands can vary drastically. I try to post the brand name of the products I use as often as possible. If you are concerned you may be using different brands than I did, making substitutions or if I didn’t list a brand, feel free to run the recipe through yourself and use the SP value you come up with! Even using different brands I can’t imagine how you’d get 19 points each for the spinach and artichoke lasagna roll-ups…is that a typo? I run every recipe through the WW recipe builder and post what I get as a helpful guideline, but you are always welcome to do your own calculations with your ingredients. Hope that helps! Thank you so mugh for these fabulous recipes! I’m making this a second time by my family’s request! Absolutely delicious! Made this yesterday and it was a HUGE hit in my house! The meatballs were delicious and vey moist. I did end up baking the meatballs 10-12 min so I could prepare other steps easily at the same time. Worked great! My kids kept saying over and over how much they loved this dish. Can’t wait make again! Thanks for letting me know this was a hit! I made this last night with frozen meatballs and 2 sweet potatoes instead of the biscuits. It was excellent!! This recipe sounds delicious. However, either I missed reading it or it wasn’t noted what the serving size for 9sp is. Is a serving 1/2 cup, 1 cup? Hi Cheryl, the serving information is always listed directly under the recipe title in the recipe section of the post. For casseroles, I usually just list the number of servings as I cut it into 6 equal pieces and serve it from there. Any idea what the SP count would be if I use lowfat (93/7) turkey instead of regular turkey? Thanks Emily! You are a ROCKSTAR! Thanks – this was very good. I baked the meatballs and it turned out perfect. Has anyone tried to freeze this after making it? I love this recipe but I am cooking for 1 most days and I don’t want to throw out food! Would freezing my portions be okay? I’m only needing 4 servings this week and definitely don’t want the rest going bad. SO GOOD btw!! I’m so glad I found your blog! I tried this Swedish Meatball Bubble Up and my whole family loved it! My kids are pretty picky and they kept saying how yummy it was. Thank you for sharing! Looking forward to trying even more of your tasty dishes! I just attempted to make this recipe and the biscuits never cooked through. The bottom part in the gravy stayed doughy.